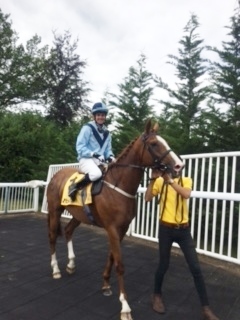 Oliver (stable lad) had probably his greatest thrill in racing so far when he had his first race ride in public at Lingfield this evening. He partnered Parisian Star in a special charity race open to stable staff. Though they didn't make the frame in the mile and a half contest, they had a great time. 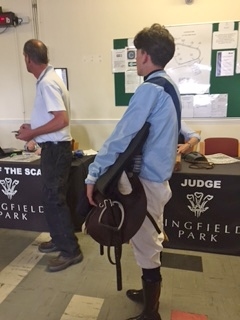 Oliver was supported at the course by his parents and other colleagues from the stable. Getting ready to weigh out. 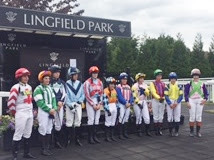 All the jockeys before the race. Horse and rider safely back afterwards.